Buy 1 "BlackHandel Puppet Rod" and get the next rod 20%off. 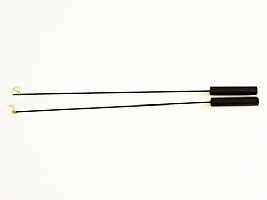 Puppet Arm Rod - Black is a lightweight wire rod designed for rod-arm puppet manipulation. Has a black wooden dowel handle for safety and maneuverability. Rod is 18" long, and coated with a matte black finish which protects the puppets from wire rust and cuts down on reflections.